This past weekend was Malice Domestic 27 (2015). Before we get too much further from the date, I wanted to recap some of the highlights. If you have never been to Malice Domestic, you should certainly consider giving it a try. 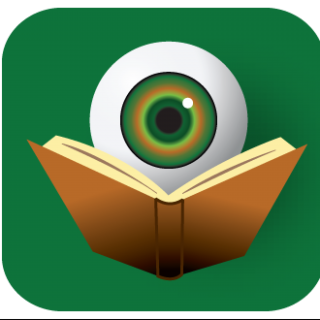 It is a crime fiction convention devoted to the traditional mystery. Often it is thought of as a “cozy” convention and while it is true that the cozy sub-genre is more well represented that at a convention like Bouchercon, there is still plenty to appeal to those who may like their literature a bit “heavier.” Hopefully, this recap will help to convince you that there is a diverse display of quality writing at Malice. For me, the Malice Domestic experience started with an early morning breakfast on Friday morning. Dining with Dru Ann Love, Judy Bobalik, and Joni Langevoort is the perfect way to begin any convention experience. There was tons of laughter, discussions of books, and plotting out of our schedules, along with some tasty French toast. Next I registered and picked up my swag bag. All convention-goers know that feeling of anticipation as you check out what books you received. Then it was off to the lobby to mingle with the crime fiction community. I was once again shocked and delighted by the volume of people who knew who I was and who followed BOLO Books. It is very gratifying to hear that people enjoy what I am doing and for every person I already knew, I was introduced to two or three new folks. There’s nothing like expanding your circle of friends. The first official event I attended was Malice-Go-Round. For those unfamiliar with it, this is a speed-dating sort of event where many pairs of authors rotate around 30 or so tables with each having 2 minutes to explain their newest title and hand out swag. Judy Bolalik and I are going to do a joint blog post about this event – our advice to authors on how to get the most out of their participation – in the near future, so look for more details coming soon. Friday is a slower day at Malice Domestic, as there is only one track of panels. I attended them all. The first three were discussions with the authors who were nominated in the various Agatha Award categories: Best First Novel, Best Historical Novel, and Best Contemporary Novel. It was great to see and hear all of these authors and learn more about their books, their process, and their future plans. The final panel of the day was a fun one in which all of the guests of honor discussed their fan mail – everything from their most positive exchange with a fan to their scariest. 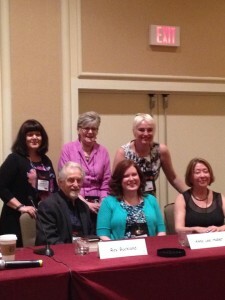 The guest of honor this year were: Ann Cleeves, Toni L. P. Kelner, Sara Paretsky, and Charles and Caroline Todd. Needless to say, the audience was honored to be in the same with these legends. Friday night ended with the Opening Ceremonies, Live Auction, and the Welcome Reception (hosted by Midnight Ink celebrating their 10th anniversary). Saturday got off to a slower start for me. My first panel was at 10am. I went to Is Murder PC? : Social Issues in Mysteries. This was a very good panel moderated by Cathy Wiley (she nailed it on her first time out) and had Susan Froetschel, Alan Orloff, and Lori Rader-Day as panelist. Lori was a last-minute replacement (due to Sparkle Abbey’s flight delay) and both Lori and Cathy handled themselves like pros. Never once was this shift in panelists obvious. They discussed everything from school violence and social inequality to Muslim ideology and child abuse. Heavy stuff for an early morning panel, but they all managed to keep the audience engaged and entertained. The first mass signing event happened after this panel. Malice Domestic does this differently from other conventions in that after a few panels, ALL the authors involved in those panels sign at the same time in the lobby “box” of the hotel. It can get crowded up there, but it’s still an efficient way to handle signings. From there, I rushed off to the Jungle Red Writers panel. This blog and their panel are both very popular, so I knew I had to get their early to get a seat. Good thing too, as this panel was eventually standing room only. I sat with Judy Bobalik and Clair Lamb. Both Clair and I put our names in the hat to be part of the game show and were both chosen. The Jungle Reds always play a game at their panel and this year it went as follows. 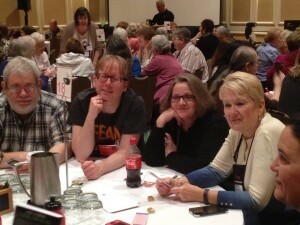 There were two teams: each with two Jungle Red authors and two audience members. Charlaine Harris played game show host and gave each team a category (say, Mysteries with food in the title) and the team had 20 seconds to name as many examples as they could think of. Fake answers were allowed, but if you got caught, you lost extra points. The audience members switched out often so more people could participate. I’m happy to say that both Clair and I were part of Team Hank (Phillippi Ryan) / Lucy (Burdette) – theteam was the eventual victor. Now mind you, I’m not saying I had ANYTHING to do with that. What I learned was that I don’t think well under pressure. But it was a blast! Afterwards, I took a relaxing lunch with Judy and Clair before heading back for the Charles Todd interview. Mother and son once again proved why they are a first class writing team and regaled the audience with anecdotes about Ian Rutledge, Hamish, and Bess Crawford. Margaret Maron was the interviewer and it was clear that she was a huge fan. 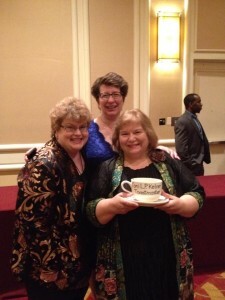 Saturday night was the Agatha Award Banquet. This year that food and wine were delicious and the presentation filled with fun and frivolity. I won’t list the award winners here, but you can certainly find them online. I was graciously invited by Toni L. P. Kelner (this year’s Toastmaster) to sit at her prime table with the likes of Charlaine Harris, Dana Cameron, Joni Langevoort, Toni’s publishing colleagues, and the Kelner Family. It was quite an honor for me and something I will not soon forget. And if I ever do, all I have to do is pull out the tasteful skull mug with flashing lights that Toni gave to all her table-mates. 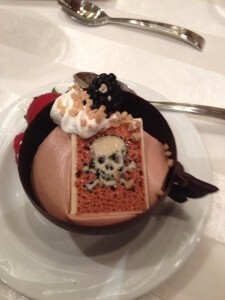 I should also mention that the banquet dessert was incredible: Milk Chocolate Mousse in a Dark Chocolate Tea Cup with a White Chocolate Skull Garnish. MMM MMM! My first panel on Sunday (ie. the first panel I managed to make it to) was the Downton Malice panel moderated by Verena Rose and featuring Catriona McPherson, Christine Trent, Anna Lee Huber, Ray Buckland, and Tessa Arlen. Let’s just say that I rushed to the book room after this panel to buy all of Christine Trent’s books featuring a female undertaker in the Victorian Period, as well as the first book in Anna Lee Huber’s series and Tessa Arlen’s debut. As a fan of both Catriona and Ray already, I would say that this panel cost me the most money – so in other words, it was a huge success. 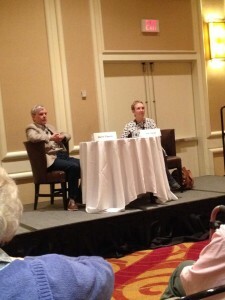 The next panel I attended was the one covering Agatha Christie and the Golden Age of Mystery. This was probably the most academic of the panels I attended and I loved it. 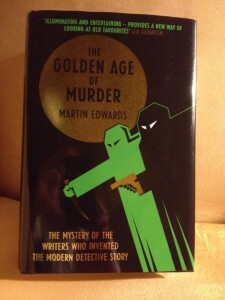 Martin Edwards is about to publish his book on the Detection Club (stop back at BOLO Books tomorrow for more about this wonderful non-fiction tome), so he and the others discussed when the Golden Age was (basically between the wars with some outliers on both sides), who some of the “stars” of the period were, and traits that were indicative of the period. Moderated by Doug Greene (who impressed me tremendously) and also featuring Daniel Stashower and Steve Steinbock this was a stand-out panel of Malice Domestic 27. The day ended with two more guest of honor interviews. First, the Ann Cleeves interview – where Martin Edwards probed Ann to reveal all the details about her various series with a main focus on the Vera and Shetland books. During the audience Q&A, I was able to ask Ann about her sidekick characters and how they often work as counter-points her main detectives. 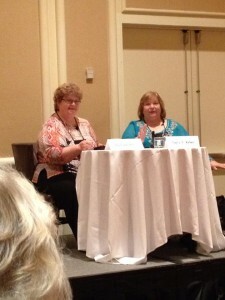 The final panel of Malice 27 was the interview with Toni L. P. Kelner (interviewed by Charlaine Harris). As always, Toni and Charlaine keeps the audience laughing and Sid the Skeleton made an appearance (in the form of the miniature skeleton doll that Toni carries with her and photographs at every location – for posting on Facebook. Malice Domestic 2015 ended with the traditional Agatha Tea – this year’s in celebration of the Grand Dame’s 125 birthday. As a gift, all of the tea-goers were given a copy of Sophie Hannah’s new Hercule Poirot novel, The Monogram Murders. Afterwards, it was hard to say goodbye to my friends – both old and new – but knowing that I would see many of them at Bouchercon in Raleigh made it just a little bit easier. Thanks for the update here, Kristopher! I had to miss too many of the panels you mentioned (especially the one headed by Doug Greene!) because of obligations in the other direction. That’s testament, of course, to the riches of Malice—so many things happening at once, too many to attend everything. Glad I got the chance to “stop by” here those ones I missed over the weekend! Indeed, Art. There is so much going on at these conventions that it is almost impossible to do everything one wants to. But there is always next year. Doug’s panel was excellent and Martin’s Golden Age non-fiction work is really something to behold. I can’t wait to dive into it more deeply. Happy that Martin is stopping by the the blog tomorrow. Oh…sounds like such a fun event. One day Tamara and I must make it there! I love Christine Trent’s Lady of Ashes series…so interesting and a good mystery to boot! I’ve read her other books, too – great historical fiction reads. Christine was very compelling on the panel, so I had to rush to the book room to purchase those books. Now I just need to find the time to read them around the already scheduled blog stuff. And yes, I expect to see you and Tamara at a Malice Domestic or Bouchercon one of these years. SOON. Thanks for the shout-out, Kristopher! Good to see you again! Hope you are feeling better, Lori. Conference season is a bad one when it comes to colds. You did a great job on the panel and I was so happy to get some time to chat with you. See you in Raleigh. I’m enjoying your updates,Kris – Thank You!! Thanks Kaye. Wish you had been there. I will make it to Malice one off these days! I will! I will! You make it all sound like so much fun, Kristopher, as I’m sure it is. Great report that lets those of us not attending knowing what we missed. Thanks so much! Thanks Tessa. I can’t wait to read the book. I look forward to seeing you at future conventions. Great coverage – some of which I had to miss, due to meeting with our agent, like the Jungle Red fun! Dang. 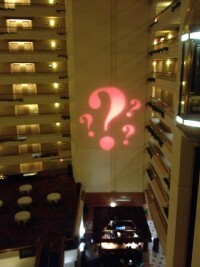 I’m curious to hear what you will blog about tips for authors at Malice Go Round. After listening for several years, I have my own ideas. What a great reminder of the banquet – a flashing skull mug! Cool. Thanks Meg. It’s always impossible to squeeze in everything one wants to see, but it sure if fun trying. As for the Malice Go Round, having been to several of these at this point, there are just some very simple things that folks can do to make this a more effective experience both from the audience perspective and from the author’s. Thanks for your comments about our “Golden Age” panel. With such a lineup — Martin Edwards, Steve Steinbock, and Dan Stashower — it was an easy panel to moderate. I didn’t have to do much! Thanks Doug. I do agree that the panelist were very knowledgeable and engaging, but don’t diminish what you were able to accomplish with this panel. Excellence all around.